Do you wish you could do the same as the lady at the end of this video? No need for a blanket ban. When I lived on Cornwall Avenue the council filled in the grass verges to allow people to park with two wheels on the pavement.Its plenty wide enough but this law could mean people getting tickets which would serve no purpose. Drivers should always leave a width of 1.5metres of footway or 1metres if constraints need. The local authority should also make sure this is the minimum in particular on main roads. 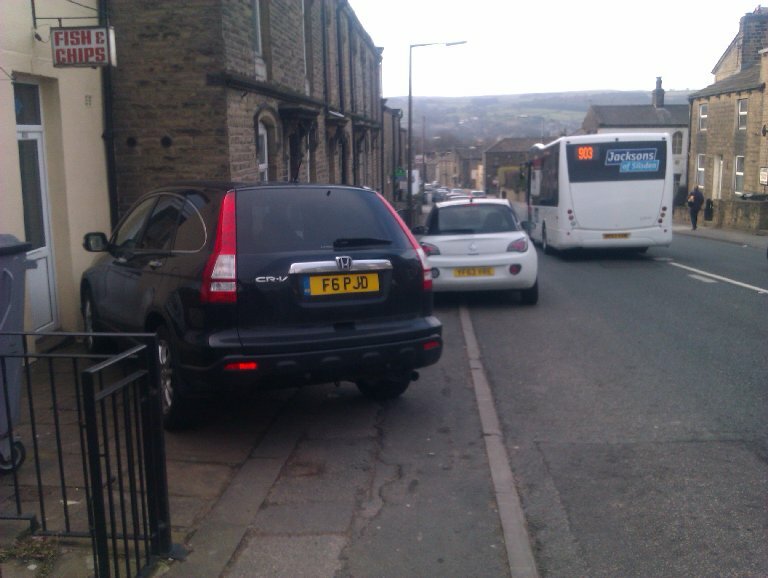 People walking between Silsden and the railway station on either side are met with pavements less than 500mm wide with no cars parked. Encountered this difficulty going to Aldi’s this morning. Had to leave the pavement whilst pushing a pram. I am not at all happy to endure this deliberate act forcing people on to an extremely dangerous road. This pavement is difficult at best of times. To be fair he does usually park on his land which is up tight against his shop wall. I bet someone was parked on the road, which they shouldnt because of the solid central white line. This would stop him parking to the left of the pavement. What is fair about parking on the pavement? Is it fair that everyone should be subjected to walking onto the dangerous road? The car was parked in that position on purpose, not by accident. Other than the other vehicle you see there was no other car around. It is clear to me that the only reason vehicles park on pavements is to give other road users more clearance thus allowing less of a chance of there car being subject to a potential smash. People appear more concerned about there cars than other people that use the pavements. It amazes me how often you see cars parked outside houses on pavements, making it awkward for pedestrians to pass when the driveways, which often can accomodate more than two cars are empty! Its a mad world and naivety or excuses doesn’t help. Last thing anyone wants to do is have to confront someone about their parking behaviour! There is really NO EXCUSE for blocking the pavement completely at any time of day. In this case there was obviously no way past the vehicle other than walking into the road. Email me your blocked pavement pictures. EURO Carparts driver forced a lady in a mobility scooter out of the way and a man walking with an infant. Peter I do not understand your request to name and shame?? All these pictures are of innocent people just going about their every day job for the benefit of people of Silsden! Yes they may be times when this causes inconvenience. If you want to shame people then lets have pictures of the people who inconsiderately park their vehicles EVERY day and/or night on pavements and cause obstructions! To be fair Peter if the council lads had put up traffic lights for a small amount of work you would have been one of the first to complain about traffic chaos. Its common sense with the lads involved on hand to help anybody past the pick up.Any idea how much it would have cost for a traffic management company to be involved for such a small amount of time. Looks like they have parked close to a pile of garden waste which they are about to load. Of course they could have parked on the road with the pile of waste blocking the path!. Is the Euro Car parts van parked???? ?.Looks to me like it has pulled onto the pavement to allow a big bus to get past(the big green thing in the picture! ).How do I work that out...the driver is in the van and in control because the brake lights are illuminated. So too bad examples. Im no fan of Bradford Council but well done to the two lads for using common sense and a parked blue van that isnt parked. If you haven't looked at the video please do so and then ask yourself have I seen some inconsiderate parking in Silsden. Did the parking on the pavement mean someone had to cross the road, or walk into the road? I am just the messenger, none of these pictures are mine. On the last pictures, there doesn't seem to be any reason for the transit to be half parked on the pavement but it does make it difficult to get by on the pavement (the pavement is supposed to be wide enough for a wheelchair or a double buggy to get by). On the parking on the pavement to let the bus by... this is just bad judgement by the van driver. It's the accompanying text which states "forced a lady in a mobility scooter out of the way and a man walking with an infant". Perhaps we should all get out of our cars an walk a bit more to appreciate the problem of the pedestrian trying to walk of pavements which are supposed to be for PEDESTRIANS. The blue van is not bad driving.. the opposite.. he is helping the bus get by in congested conditions.. parking in that area is a farce and should not be allowed at all. But no one will do anything about it... and please don't quote traffic calming... it's traffic stopping. Shambles...! So when is the 7.5tonne limit going to happen? Sorry about the poor quality of the picture. The blue lorry was completely on the pavement and the white lorry was dodging parked cars. Perhaps this is the everyday life of a lorry driver but we don't need the experience in Silsden. Councillors please get it sorted. Over my life time you could have made a living replacing Barkers/Isherwoods awnings! the person that took the picture needs to do it, its not on my phone/camera is it! The 7.5 tonne limit is a red herring... 2 Transit vans can't even pass each other because of cars parked in Kirkgate, so stop the parking, get people to park 40/50 yards away in Wesley Place Car park instead, and get the traffic flowing properly. Crosshills does it well, with a 20MPH limit and no parking on the main street. Maybe if the Environment Agency were invited in to check pollution levels in Kirkgate, people would understand. And people would see that they would not have to wait as long in traffic queues either. The new pedestrian lights near Clog Bridge show how change can be an advantage if people put some thought into it. Things are so much better there... let's take the next step and improve Kirkgate please..
Traffic flow along Kirkgate is only going to get worse with time, especially if we have more house building in the area. Each new home will probably bring with it at least one car together with more people commuting to and from work at rush hour and children being transported to and from school. Traffic generally flows quite well along Kirkgate, and the new crossing enables people to get out of Elliott Street and Howden Road. As stated by others, things come to a standstill though when buses and other large vehicles meet or have to negotiate around parked cars. I am in favour of NO PARKING along the length of Kirkgate as long as suitable speed restrictions or traffic calming measures are in place for when Kirkgate is clear of traffic. My only concern is for parking for customers of local businesses, but I would hope a solution could be found. All the solutions will cost money and inconvenience someone. As there is no such thing as a free lunch nothing will happen until people realise one does not get owt for nowt. 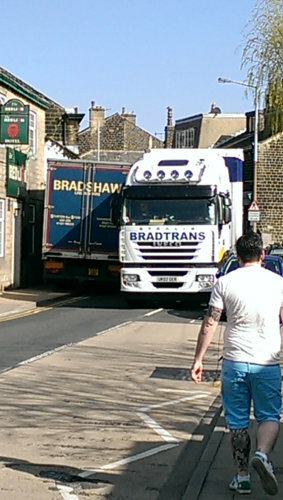 There is no need for large lorries to come through Silsden as was proved when there was a ban on HGVs when the gas pipe was replaced. Paths for feet, roads for wheels...Sorted!!! at least the yellow lines are back for a few weeks opposite the red lion to the cafe. No problems,let's hope it's permanent. And still room in the car park.